Welcome to our Wrede Family web sites! Here you'll find pages featuring our hobbies, pastimes and interests. Including: model railroading, prototype railroading (real trains) and live steam. 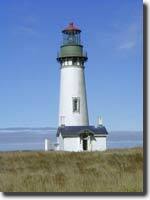 Enjoy the ocean breezes by visiting our pages featuring the Lighthouses of the Oregon Coast and Northern California. And don't forget the Covered Bridges of our area in Southern Oregon as well as stories of interest for cat lovers. Now featuring Richard's vintage camera collection. Here is Richard's site, the original "Tunnel 13, Railroading in Southern Oregon" with subjects on Railroading including: Prototype, model, live steam, parks, history of the Siskiyou Line, the Southern Pacific Railroad, UP, CORP and more. Film photography buff's, check out my new Vintage Camera's site! Check out my Blog, TunnelBlog!. Richard's main page, "Railroading in Southern Oregon"
Here is Cheryl's site featuring: Tucker the cat, "My Autobiography". True tales of a poor abandoned - left for dead cat from Ohio. Also, Tucker has humorous stories of day to day life and he tells about his mom's interests in the arts. We also have pages about the Covered Bridges of Southern Oregon. Check back often for updates on the bridges and lighthouses. And Tucker has a Blog too! tunnel13.com domain is owned by R.Wrede, email spaming prohibited..